Data bleed happens when disjoint technologies are improperly put together. A typical example would be the loss of information, such as customer's contact information as it travels from one system to another. Let's see how this causes poor customer experience. Knowing our customers is one of the most important pillars of our business. It's what makes a business successful, and perhaps sometimes immortal. But that doesn't mean we should spend all the energy in capturing every single bit of their lives, and give them a feeling of 'creepiness'. 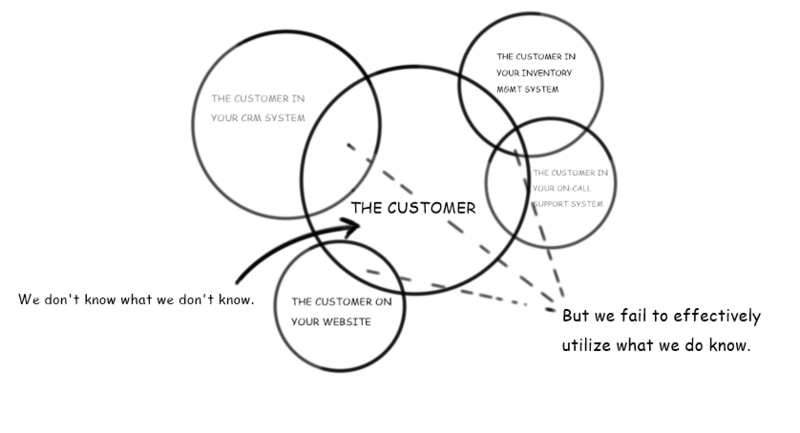 We should keep our distance and be OK knowing that we don't know what we don't know about our customers. What's more important is how effectively we are able to utilize what we do know about them. And that requires a careful look at our various in-house systems – from our CRM to our Inventory Management, Customer Support, our website, and everything that we use to interact with our customers. More often than not, these systems use vocabularies and data sets that are hard to map with each other. Some systems aren't capable of storing all the information at all in its full entirety. For instance how many times have you seen a system that imposes limits on how many user interests can be stored or the character limit of a certain field; Pretty much every single time! Now imagine if a newer web analytics system or a CRM system is able to capture user interests as a 'list', but your another 'old' system can only capture interests as a comma separated string with a maximum character limit of 1024; All of a sudden you have 'data bleed'! The result of data bleed: Things like irrelevant news letters that our customers don't care about, start getting annoyed, and eventually completely stop reading our emails; Offers and coupons that our customers receive but never wish to redeem; And so on. There are hundreds if not thousands of such scenarios that happen in everyday marketing, which are mainly a cause of what we call 'data bleed'. So how do we stop data bleed from happening? One of the ways to solve this problem is by coming up with a 'data compression' strategy. For example, a user interest called 'Retail Technology' could be compressed to 'rtech' to make room for more interests in a data field that accepts interests as a comma separated string with a limit on the length of the string. The problem of course here is coming up with an innovative compression strategy that would work for your business and would be easy to maintain in the long term. Whenever we see multiple systems in a marketing ecosystem (which by the way happens pretty much all the time), stopping data bleed should be our number one priority as marketers because we know it will happen. Systems don't talk with each other like they should, and sometimes are very uncooperative with each other. The more delay you make in thinking about data bleed, harder it will be to solve the problem because lot of data loss would have already happened. Always put 'data bleed' into consideration during your marketing system integration efforts.